THIS COLLECTION CONTAINS ALL 3 TV MINI SERIES ON 8 DVDS. THESE ARE BACK-UP COPIES DIRECT FROM THE RETAIL DVDS..
DVD'S COME IN PLAIN WHITE SLEEVES,NO ART WORK. Tales of the City is a 1993 television mini-series based on the first of the Tales of the City series of novels by Armistead Maupin. 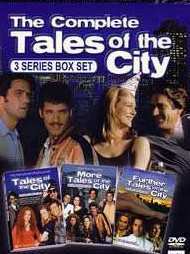 The first three books in the sequence have been adapted into television miniseries; the first, Tales of the City, the second More Tales of the City,and the third Further Tales of the City.This set contains all three mini series. It was a time when San Francisco was a city where the unlikely always seemed to happen, whether by co-incidence or by fate, and where true love occurred in unexpected ways. It was a city buzzing with innocent but naughty fun, where people went to the supermarket and the Laundromat to meet potential lovers and to co-ed bathhouses for the cleanest orgies in town. The inhabitants of 28 Barbary Lane, San Francisco, present an extravagant range of sexual orientations and obsessions. They’re inhabitants of society’s dark fringe, and yet they yearn for a sense of belonging to give their lives meaning. As their lives intersect, shocking secrets are revealed, startling events transpire and mysteries are explained. This second sequel to "Tales of the City" finds Mary Ann Singleton struggling to advance in her new career as a TV personality, while Michael Tolliver is playing the field after his break-up with Jon Fielding. After her divorce, Prue Giroux finds comfort in a mysterious stranger she meets in the park. Brian Hawkins is struggling with his job and his new monogamous relationship with Mary Ann, and DeDe Halcyon Day returns with a dangerous revelation that could be the scoop Mary Ann has been waiting for..